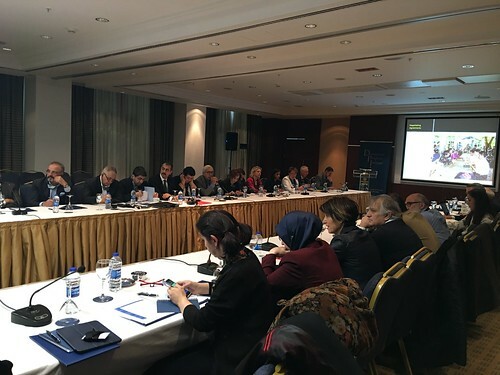 On 4th March 2017, the Democratic Progress Institute (DPI) held a roundtable in Ankara which brought together a diverse group from Turkey’s political and cultural spectra. Participants included chief advisors to the president and prime minister; members of parliament from AK Party, HDP and CHP; Wise People Committee members; academics; prominent media representatives and journalists; civil society representatives and ambassadors. This inclusive roundtable was the first event organised by DPI in Turkey since the attempted military coup d’état, therefore, the focal theme was dialogue in difficult times. The roundtable explored the peace process experiences, with their setbacks and challenges, of Northern Ireland and the Philippines. Speakers included implementers of the Good Friday Agreement – chair of the Police Foundation, Sir Bill Jeffrey, and former Irish Minister for Foreign Affairs, Dermot Ahern. Meanwhile, Eurasia Regional Director at the Centre for Humanitarian Dialogue, David Gorman, outlined his experience in the Philippines peace process. Through analysing the lessons learned from the peace process of the two countries, the engaging discussions emphasised the significance of building trust and confidence on all sides, the role of third parties, and the importance of maintaining dialogue throughout the process. The full transcript and report will be published at a later stage.